Director Abbas Tyrewala reunited with music maestro A.R. 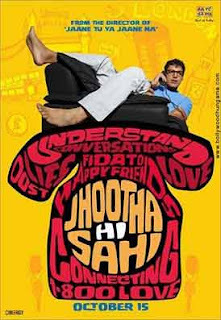 Rahman for his forthcoming film "Jhootha Hi Sahi" to repeat the musical success of "Jaane Tu... Ya Jaane Na" and the music maestro has composed a beautiful track in the guise of "Do nishaniyan". The rest of the album has hits and misses, but it's worth listening to once. The film, a home production of Saregama, has nine songs. To begin with, the album offers "Cry cry" crooned by Rashid Ali and Shreya Ghoshal, which is occupying airwaves and broadcasting time currently. The song is different owing to the lyrics and the interesting composition. It is zippy and exudes freshness. Next in line is "Maiya yashoda" that is doing the rounds of TV channels. It has two versions - one is the Jamuna mix with Chinmayi and Javed Ali and the Thames mix by the same singers. The song has a complete Indian flavour and is quite upbeat. The Thames mix is quite similar, just that more electronic beats are added to this one. Then there is Karthik singing "Hello", a song that totally revolves around the telephone. It's more of a situation number and even the dialling tone is used in the composition. Not hummable but worth a listen. Then comes the best song of the album "Do Nishaniyan" with Sonu Niigaam behind the mike. The track has a poignant beginning and Sonu's silken voice is perfect for this slow-paced rendition. The orchestration is subtle and enjoyable. One of Rahman's great tracks that shows his prowess of being different. The track also has a reprise version, sung by the same singer. The version is just a little slower and has more depth, but both the songs are equally interesting. Next Shreya goes behind the mike yet again for "Pam para", a foot-tapping and high-on-energy track. It's neither bad nor brilliant. "Call me dil" starts with a beautiful acoustic piece that gives it an edge. Rashid Ali does a great job with the vocals. The song is quite melodious and grows on you when you keep listening to it in loop. The soft track manages to create its mark. Finally, there is a half-English half-Hindi song "I've been waiting", crooned by Vijay Yesdus. The song oozes softness and creates a balmy effect on the listener. A wonderful composition. On the whole, Rahman has yet again created an album that has a mix of various genres and keeps the listeners' interest intact.